I was doing some research and came across an article on McDonalds and thought to myself “When was the last time I ate there”? Thankfully I could not remember the last time I ate fast food at all. It seems like everywhere you go there is a McDonalds restaurant on the corner. Now they are in hospitals, colleges, airports, and even churches. I remember watching a documentary Super Size Me and it was very interesting but sad of all the negative health effects that Morgan Spurlock developed just by eating fast food all those times, not to mention all the weight he gained as well. He put his health on the line just to educate and demonstrate how our bodies react to these foods. If you haven’t seen the documentary I highly recommend it. Fast food costs are inexpensive and tastes very good, but the negative effects on physical health last much longer. With the high-calorie meals come more fat, cholesterol, salt and sugar — and therefore fewer vitamins, minerals and other nutrients — than in healthier foods. The USDA Dietary Guidelines for Americans reports that these eating habits create nutritional deficiencies along with weight gain. The health problems that stem from overweight and obesity alone can severely limit lifestyles and shorten life spans. 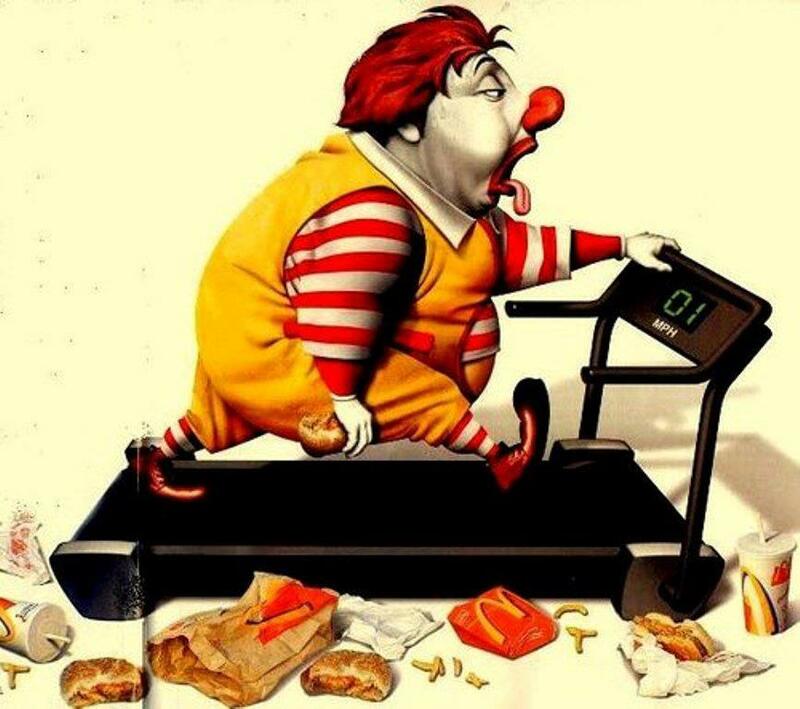 Fast food can be the biggest contributer to obesity. Fast foods are loaded with fat and calories. Ordering without limits may have negative effects on your health and weight. Hamburgers with multiple patties, cheese, bacon and mayonnaise may exceed the 65mg fat limit recommended by the USDA for the whole day. Many drive-through foods and drinks have high sugar content, including milkshakes, 62g of sugar, and colas, 44g, in 16-oz. servings as per the USDA. Fast foods contain high amounts of cholesterol and salt, two nutrients that contribute to cardiovascular health problems. The U.S. Centers for Disease Control and Prevention report a direct link between sodium intake and negative effects on blood pressure, and note that Americans consume most of their sodium in processed and restaurant foods. What have fast food companies done to make things better? Fast food companies are developing healthier options to meet the desires of healthier consumer needs.. Many fast food chains now offer healthy options including low-fat, low calorie foods; fresh foods; bottled water; and salads made with fruits and vegetables. Some stand-outs in fast food nutrition include low-fat salads and sandwiches and grilled chicken. Other healthier options have been added to many fast food menus. Low-fat yogurt, fruit cups and wheat buns can replace some of the higher fat and lower fiber meal options. However, these healthy choices have the ability to take a wrong turn when mixed with unhealthy selections, such as fried chicken and high-fat dressing on the salads, cookies, candies or high-sugar granola mixed into the yogurt or whipped toppings on the fruit. Stick with the food in its most natural form to get the highest nutritional benefit from it. Obviously I know that fast food isn’t the greatest thing for our body, but when I read some of those numbers you quoted regarding sugar content etc, it still surprises me. Nice post my friend! Thanks alot Matt! Yes even when I research the numbers I even more surprised! Makes me want to stay away from it even more! Great post btw! I will continue to visit. It’s refreshing to see a post that is within the ‘fitness’ parameters, but with a new twist. Good work! Exactly on the salads. Very few I’m sure. Thanks for sharing. It’s so good that you are also helping people become aware about dangers on fast food. Love that picture, reminds me of me! So good! We stopped eating fast food about 6 years ago but the kids still had Wendy’s nuggets once a week until this year. Since gluten free – Now we skip it altogether! That’s awesome!! I’m a big fan of gluten free foods!! I don’t eat beef, so that is not my restaurant of choice. I do like the fries I must admit. I do realize that it is true a very unhealthy way to eat so I do most of my cooking at home. It helps that I love to cook. 🙂 Excellent post. Thanks. I try to cook at home as well as much as possible. But sometimes It can be a challenge. Thanks for sharing and I am glad that you liked the post. Hope all is well! Another great movie is “Fast Food Nation” with Greg Kinnear. Between “Super Size Me” and “Fast Food Nation”, no one should want to east fast food again! But it is far too tempting to eat poorly when RaceTrac gas stations offer 32oz sodas for 59 cents. It’s craziness. Good post I’ve seen the movie. Note the size of people working in fast food chains. They’re eating their own product. haha. You can get strict just takes some time. Set small goals to get to the big goals. Maybe cut out fast food to twice a week, then once a week then none. It def takes time. Thanks for sharing with us! I used to eat fast food at least once or twice a week. I gave it up, though, when I started my weight loss journey. I don’t miss it, at all. I’ll grab something quick like once every other month or so… I try to stick to subway or local sandwich shops, but I do occasionally give in to my burger cravings. I’m always disappointed; they don’t taste as amazing as I remember. I’m also always left with stomach pains and fatigue. I don’t know how I was able to eat it so often before. Nice that you gave it up! It seems that more and more people are giving fast food up lately. Yes I will have Subway myself from time to time. Maybe a veggie salad or sub. Thanks for sharing. LJ you hit it right on the head. I saw a documentary where a lady saved a mikkyD’s burger for six months. it had no mold, nor was it decomposed, the bun was hard, the meat was dry but really no change. is that what you want in your stomach?? there are no real benefits to fast food, with practice and planning you can have a great, high quality meal on the table in 30-45 minutes. that is just awful- the food not getting old nor molding. I definitely do not want this is my body, Thank you for sharing. Planning meals takes time but is so worth it! Nice post! I think social pressure is starting to make slow changes in Australia. Many fast food restaurants now put the calorie content of foods on the menu right next to the food choice. Of course this does no express the vitamins and other nutritional value, but at least you can see how many kilojoules you are eating. As time goes by we are seeing more low calorie options added to menus, as well as the rising popularity of places like “sumo salad”, which sell low (and high!) calorie takeaway salads. I love a big mac…..it’s an entity unto itself…it’s not a burger…. I look forward to reading your other posts…..I’d be interested to read about exercise options for people with chronic pain…me….Fibro…..since I can no longer push push push it’s more about balance than endurance….but I would like to get back into strength training…I used to really enjoy my free weight routines…..I’m thinking of going back to it and just scaling in way back…any thoughts? Of course! Its great that you are taking steps to get back into strength workouts. My biggest advice is to try to focus on at least 2 body parts per workout. For an example, on Monday I would focus on legs and abs for my strength exercise. Tuesday I would focus on Biceps and Back. I use a 5X5 method- 5 reps and 5 sets if you are using weights. It is also a good idea to try and focus on calenstinics type workouts when you use your own body weight. Pushups, pullups, air squats etc. Good luck to you and let me know how it goes! I’m going to keep this short and sweet. Fast food isn’t food. An interesting issue in this line of thought is how fast food chains are reacting to the historic drought. Large cattle farms were on the brink of bankruptcy/total loss, yet prices and supplies remain the same in most, if not all chains. How do they achieve this? Well, part of the answer lies on how they modify and process foods, specially meats, before the burger and chicken makes it to the tray. Synthetics are not affected by the drought, of course. Does it seem that mcdonald’s targets poor neighborhoods? I don’t like how mcdonald’s targets children. Brain washing, they call it marketing. You’re right Jason especially with the happy meals, toys and playground. I always wanted to go as a kid because of those reasons. Great post, I can’t remember the last time I had fast food either! I think it’s funny how the term “as part of a balanced diet” is often applied to fast food, implying that if you eat healthily some of the time it’s ok to treat yourself to fast food every so often. The reality is, if everyone applied that logic, the fast food industry would be crippled! Exactly! I always thought about the same thing. It seems like more and more people are jumping off the fast food wagon. Well done L-Jay, both for achieving your health/fitness goals and for creating a great blog! When I first came to Greece there were no “Golden Arches” – only the neighborhood grill houses/kebab joints which as fast foods go are pretty healthy by comparison. In the mid 90’s legislation changes regarding franchising allowed the invasion to begin – A three story McDonald’s opened right on Constitution Square! Quickly followed by KFC, Wendy’s, Baskin&Robbin’s, Pizza Hut, Domino’s, Starbucks… The local menu includes what they call the Big Tasty – an 850 calorie sandwich and 300 of those calories (not to mention huge amounts of salt) are in the sauce alone! Ray Kroc, was a wily businessman – I read the transcript of a lecture of his, his contention was that he wasn’t really in the business of selling fast food but that of obtaining and increasing the value of real-estate. The whole burger business was the pretext but the greatest profit was generated via his property holdings and subsequent capital investments than was ever generated by selling burgers. WOW alot happened in the 90’s for Greece. A 3 story McDonalds sound huge. I have only seen a 2 story here in US. 850 calorie sandwiches are no good for anyone. Especially with all the tourism in Greece I could see why they wanted to place fast food chains there that would be profitable. Thanks for sharing! Really great and informative post L-Jay. Keeping food simple, real, and natural builds a whole different body and spirit. We really are all aspects of what we eat.. Thank you! Yes, different body and spirit! Youre right about that. This is a huge truth! L-Jay, great post. In my former life, I was on the raod most weeks. The few times that associates would swing by a fast food joint, I’d get a salad, and guess what? All of the fast food chains have good salads. People don’t believe me. My theory is that they are all competing for the health-conscious demographic who typically drive right passed the McDonnalds, Wendy’s, Burger Kings, etc. etc. But it’s a good option, and most offer drinks other than soda. You still have to watch the dressing and make sure they don’t put fried chicken on it, if you get the chicken option. I wouldn’t make a habit out of fast food salads, but I find it a healty option. Reblogged this on Nutty Alternatives. Great post! I just reblogged it on nuttyalternatives.com When SuperSize Me came out many years ago, it was the first time I had ever heard about just how bad fast food was. The movie was shocking to me…at the time. I’ve come a long way since the 8 years ago I saw it. In fact, my four kids have never eaten at Mc Donalds. Shocking, I know! Love that cartoon, ahhha. We eat out to dine, rarely to just fill up quick. Seems there are opportunities to make better choices at most places, but it’s usually stuff I can easily make at home so why bother. Exactly! I feel the same way. Why buy it when I can easily make it. Love it~ I don’t like burgers, but I’m a sucker for chicken burgers T.T I cut out the fries and only drink diet soda~ I think fries are the absolute worst culprit… such a small amount leads to huge calories and no feeling of satisfaction @. @ I could eat a popcorn bucket full of fries and not feel full, but even a small serving has 400 calories @. @;; A chicken burger at McDonalds (in Korea, at least, lol) has 440 calories… not too bad and it has veggies and such, too. A chicken burger at BK has over 600 calories but is much bigger… harder to fit into a low-cal diet, but still, if you’re willing to work out a little more at the end of the day… why not? I don’t eat fast food too much these days, but I really love it… But then, I look at my body and think, “do you want to look like this forever? do you want to throw away all those burned-off calories for that?” and only eat it on certain occasions now~ ^.^ Nice post! Reblogged this on No Longer Being a Butterchubs. Could not really pick an option from survey. I do eat fast food, having a kid it’s hard to explain that it is not the greatest meal. We go maybe 2 or 3 times a year, Wife and I make it an award (how kids find greasy rewarding ><). I prefer making my fast food at home, turkey to replace hamburger, w/w pita with pesto and veggies/chicken to replace pizza joints. sunflower oil, chicken, garlic powder, chicken fat, spices), sodium phosphates. mono-and diglycerides, sodium benzoate and potassium sorbate (preservatives), artificial flavor, citric acid, vitamin A palmitate, beta carotene (color). Great illustration and good point. Almost makes me want to print pics of that image and put it on the front window of every mcdonalds I see. I just watched Super Size Me not too long ago…. It is definitely too bad that people seem to have such a lack of understanding about nutrition. I’m in the same boat, I can’t remember the last time I ate “fast food.” There are a couple local places that make food fast, but aren’t along the McDs line. I have a friend who every time we are in the car makes a pit stop for some fries. It used to be kind of a temptation, but not in the past year or so. Haha that’s funny, making pit stops to get fries. This calories definitely add up. Some large fries have over a 1000 mg of sodium and over 800 calories. Awesome for you that you stopped! It’s ok to splurge every now and then!